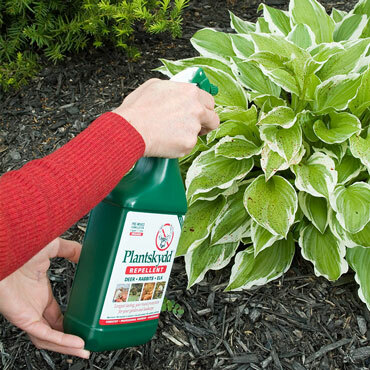 Plantskydd® Repellent | Gardens Alive! Growing delicious veggies or beautiful plants can be difficult when deer want to make your garden their primary source of food! Our Plantskydd Deer Repellent comes in a convenient spray bottle to discourage deer, opossum, rabbits, elk, and even moose from snacking on the plants in your garden. This organic, non-toxic formula contains no synthetic additives and is safe for animals, plants and the environment. It can be sprayed directly on or around plants, and can protect them for up to 6 months on dormant plants. Do not spray on or around edible crops 3-4 weeks prior to harvest.